Q: When I go to bed without removing my contact lenses, I sleep in my contacts. Or so I say, even though the reverse is true: my contacts are in me when I sleep. What say you? A: The preposition “in” has been used to mean “wearing” since Anglo-Saxon days. The earliest example in the Oxford English Dictionary, from an Old English translation of Exodus, refers to mourners in blacum reafum (in black robes). You’re right, though, that when “in” is used this way we’re usually in clothing of one sort or another (a dress, a suit, a dinner jacket, and so on). As we said then, an idiom is a peculiarity of language—an expression or some characteristic of speech that’s peculiar to a language, a region, a dialect, or a group of people. Sometimes an idiom doesn’t make literal sense (“it’s raining cats and dogs,” or “he reached for the stars”). At other times it’s grammatically unusual or doesn’t parse (“I could care less,” “that dress isn’t you”). An idiom can also be a specialized language or vocabulary used among a particular group—like doctors or journalists. Or it can be a particular regional or dialectal speech pattern. “I can’t wear glasses because it hurts my nose. I can’t wear contacts because it hurts my nerves” (from Money: A Suicide Note, an 1984 novel by Martin Amis). Q: When I was younger, I didn’t hear anyone say “close with,” but now I hear it all the time. Example: “She’s close with her sister.” For me, it should be “close to.” I did a Google search, however, and got millions of hits for “close with.” Am I crazzzy? By the way, Google search results are often misleading. When we searched for “I was close with him,” for example, Google reported 4,430,000 results. But when we went to the last page of the results, we found that the actual number was 127. As for the etymology, “close” showed up in writing around 1275 as a verb meaning “to stop an opening; to shut; to cover,” according to citations in the Oxford English Dictionary. The OED says the verb came into Middle English from the Old French clore, which in turn came from the Latin verb claudere (to shut, to close). Adjective and adverb forms came along in the late 1300s, with the adjective generally meaning closed or shut, and the adverb meaning in proximity to. It wasn’t until about 1500 that the adjective “close” took on meanings having to do with nearness of one kind or another, whether “in space, time, form, or state,” as the OED says. Nevertheless, “to” has long been the preferred preposition following “close” in the sense of nearness. In fact, “close to” is sometimes referred to as a complex preposition in itself. The Cambridge Grammar of the English Language goes further and says that “close” by itself is sometimes a preposition rather than an adjective. When they act as prepositions, Cambridge says, they behave in some respects like adjectives. For example, they’re “gradable”—that is, they can be modified by “very” and “too.” And they have comparative and superlative forms (“closer to” … “closest to”). But there are differences between “near,” “close,” and “far” when used as prepositions. For example, Cambridge notes, “near” as a preposition can be followed by a noun phrase (“near/nearer the pool”) or a “to-phrase” (“near/nearer to the pool”). But the grammar book says “close takes only a to phrase and far only a from phrase” (“close/closer to the pool” … “far/farther from the pool”). Getting back to your question, will “close with” eventually be considered normal in the intimate sense? As we’ve often said on the blog, only time will tell. Did World War I give us cooties? Q: I tuned in late to Pat’s last appearance on WNYC and just caught the tail end of her discussion about cooties. Did I hear right that World War I gave us the word? A: When the word “cooties” first showed up, it referred to the lice that were rampant on the bodies of soldiers fighting in the trenches during World War I. The noun “cooties” was derived from a slightly earlier WWI word, “cooty,” an adjective meaning infested with lice and first recorded in 1915. The phrase “going cooty” meant getting lice and being quarantined for de-lousing. It’s been suggested that these words—“cooty” and “cooties”—may have come from kutu, a word for louse in the Malay or Maori languages. The word “cooties,” as you know, is now used loosely (and often humorously) to mean imaginary germs or bugs. We found a recent example in Notorious Nineteen (2012), a novel in Janet Evanovich’s series about the klutzy bounty hunter Stephanie Plum. For dozens of years, the term “cooties” has also been the name of a children’s tag game that often pits boys against girls. In “Tradition and Change in American Playground Language,” a 1973 paper in The Journal of American Folklore, Herbert and Mary Knapp describe how a designated “cootie carrier” spreads an imaginary infection by hand. People refer to American soldiers of World War I as “doughboys,” and to their British counterparts as “Tommies”—but in fact both terms preceded the war. “Doughboy” was American Army slang for an infantryman as far back as the 1830s. And “Tommy” (short for a mythical “Thomas Atkins,” a generic name for a British soldier) dates from 1881, as we’ve written on our blog. But plenty of words did originate during WWI, though many of them have since lost their wartime associations and acquired figurative meanings in everyday language. A WWI term that’s acquired a wider meaning is “shell shock.” It was introduced in 1915 to describe a combat condition that we might now call post-traumatic stress disorder. It’s now also used more broadly to mean any kind of emotional upset. The very modern-sounding verb “liase” was first used by British officers in WWI and has gone on to be widely used (or misused, as many people think) in civilian life. We’ve written about the history of “liase” on our blog. Another modern-sounding term, “zero hour,” also came into use in 1915, when it meant the time at which a military operation was to begin. Later it acquired an extended usage: the time at which any event is scheduled to take place. “Zero in” also owes its origins to WWI, when it meant to adjust one’s rifle sights. It now means to focus or home in on something. “Tailspin” is yet another example. When first recorded during the war, it meant a steep, uncontrolled, spinning descent of an aircraft with engine failure. But it now can mean any kind of rapid, out-of-control fall—as when having 22 errands on your list for the day sends you into a tailspin. Here’s a term that many people don’t associate with WWI—“trench coat.” But when first recorded (in 1914), it meant a lined or padded waterproof coat worn by soldiers in the trenches. As you might expect in an era marked by new ways of waging war, many of the words that emerged in 1914-18 have retained their original wartime meanings. These include “air raid,” “anti-aircraft,” “gas mask,” “flame thrower,” “storm trooper,” and “tank”—originally a code word used in 1915 while the armored artillery vehicle was being secretly developed. Another military word, “strafe” (1914), was derived from the German verb strafen (to punish), and was plucked from a famous German propaganda slogan, Gott strafe England! (“God punish England!”). German also inspired “U-boat” (1914), meaning a German military submarine. The “u” in “U-boat” was from unterseeboten, the German word for the submarine. Even on the home front, the war made changes in our language. The term “home front” itself came out of WWI, as did the nickname “Aussie” (for an Australian soldier), and the phrase “over there” (meaning Europe), which was popularized by the George M. Cohan song of that title. A different category of WWI words includes those that (like “doughboy” and “Tommy”) were around before but didn’t become household words until the war brought them into the news. Examples include “Zeppelin.” While the airship was developed at the turn of the century, the word didn’t come into common use until the Germans used Zeppelins in bombing raids in 1914. “Dogfight,” too, had been around in figurative usage as a word for a struggle or melee. But in 1918 “dogfight” was first used to mean an air battle between warplanes. Those dogfights may have been fought by “aces.” That word, too, had been in earlier use to mean someone who excels. But it wasn’t used until 1916 to mean a daring flier—like a pilot or gunner—who brings down lots of enemy planes. “Submarine” had also been around before WWI, but it was a mere novelty until the war at sea made it a household word. Similarly, the phrase “cannon fodder” was around earlier but emerged from obscurity in WWI and is now forever associated with that war. Another word dreaded by troops—“shrapnel”—was first recorded in 1914 in the sense of fragments from shells or bombs. But it came from an earlier sense of the word. In the 19th century, a “Shrapnel” (named for its British inventor, Henry Shrapnel) was a type of hollow shell containing bullets and a charge. Even the way people referred to the war has an interesting history. Early on, in 1914, it was called “the Great War,” and was sometimes referred to as “the war that will end war,” a phrase credited to H. G. Wells (it was the title of a book he published that year). The phrase “First World War” was coined toward the war’s end, in September 1918. But the name we probably use most often, “World War I,” was first used by Time magazine in its issue of Sept. 18, 1939, shortly after Germany invaded Poland and ushered in the next world war. Only the previous week, Time had become the first to use the term “World War II” in print. Q: The words “move” and “appreciate” are often used in local government in San Francisco, but not always to my liking. I hear “so moved” when a motion is approved rather than introduced. And I hear things like “I want to appreciate her advocacy” instead of “I appreciate her advocacy.” Your thoughts, please. A: We’re volunteer land-use commissioners in our small New England town, so we’re intimately acquainted with the jargon of local government. Some parliamentary mavens object to the use of “So moved” in such a case, insisting that it’s too vague and that a full motion should be made. We see nothing wrong with using “So moved” for relatively minor motions like those mentioned above. But we’d recommend a formal motion in more complex situations, such as a vote on a series of amendments to revise building setbacks. 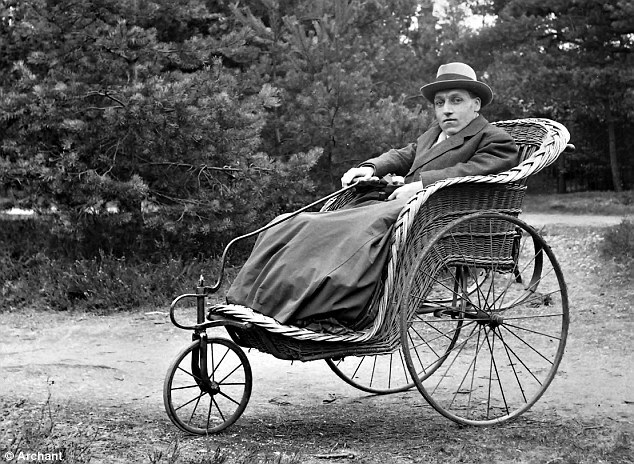 Q: I found a photo online, apparently from the early 20th century, of a disabled man in a basket chair. Could this be a clue to the origin of “basket case”? A: The man pictured in the basket chair (a three-wheeled woven rattan wheelchair) is nowhere near as disabled as the original basket case—had such a basket case ever existed. However, the phrase, which initially referred to American soldiers supposedly left limbless by the war, was a product of the postwar rumor mill in the US. No quadruple-amputee American soldiers existed, and there’s no evidence that any head-and-torso survivors from any country were carried around in baskets. Nevertheless, word spread that limbless soldiers were being warehoused in one place or another in the US. As a result, the Surgeon General of the Army, Maj. Gen. Merritte W. Ireland, said in 1919 that the rumor had absolutely no foundation in fact. “I have personally examined the records and am able to say that there is not a single basket case either on this side of the water or among the soldiers of the A. E. F. [Allied Expeditionary Force],” he explained. According to newspaper accounts of the time, only one Allied combatant, a Canadian soldier, is known to have survived the war after a quadruple amputation. He was Ethelbert (Curley) Christian, a Pennsylvania-born African American who had settled in Canada and joined the Canadian Expeditionary Force. After he was gravely injured in April 1917 in the Battle of Vimy Ridge, surgeons amputated both arms below the elbows and both legs below the knees. But he was no “basket case.” He was fitted with prosthetic legs, and family photos show him standing upright. He is even said to have devised an arm prosthesis that enabled him to write. He lived a productive life, dying in 1954. The term “basket case” isn’t used anymore in that original sense; it refers now to an emotionally disturbed person or an ineffective organization, nation, business, and so on. In the early 1950s, the phrase came to mean “a person who is emotionally or mentally unable to cope, esp. because of overwhelming stress or anxiety,” the OED says. Q: I recently found an old diary in which my grandmother wrote this about my uncle: “today the baby was shortened.” What in heaven’s name could she have been referring to? She was born in 1893, grew up around Philadelphia, and had my uncle around 1925. She was Catholic so it couldn’t have had anything to do with circumcision. It turns out that in the 19th and early 20th centuries, both male and female newborns were clothed in dresses (long clothes) that came down below their feet. When the babies were a few months old and beginning to crawl, they were “shortened”—that is, clothed in ankle-length or calf-length dresses (short clothes or short coats) so they could move around. Q: Has the use of the term “half-dollar” to mean fifty cents fallen out of favor? I never hear it anymore. A: Standard dictionaries generally define the term “half-dollar” as a coin worth 50 cents, not as an amount of money valued at 50 cents. The 1964 John F. Kennedy half-dollars were the last to contain silver (the percentage of silver was reduced from 90 percent to 40 percent from 1965 to 1970). You seldom see a half-dollar today, except in coin collections. That may be another reason why the term “half-dollar” is rarely used now to mean 50 cents. As “the popularity of the Kennedy half dollar began to fade,” production fell from a high of over 429 million in 1964 to just over 3 million in 2011, according to the numismatic writer James Bucki. Are “loath” and “loathe” related? Q: I assume the adjective “loath” (meaning reluctant) and the verb “loathe” (meaning to dislike) are relations of one sort or another. Which of these came first? And where did it come from? The adjective, according to Ayto, “originally meant ‘hostile’ or ‘loathsome,’ and goes back to a prehistoric Germanic laithaz,” which gave German leid (sorrow) and French laid (ugly or disgusting). Two of the earliest examples of the adjective “loath” in the Oxford English Dictionary are from the Old English epic poem Beowulf, which is believed to date from the 700s. Early in the poem, the monster Grendel kills dozens of warriors, leaving King Hrothgar grief-stricken from a feud described as to strang, lað ond longsum (“too cruel, loathsome, and long”). It wasn’t until the 1300s that the adjective “loath” took on the modern sense of reluctant or unwilling, according to examples in the OED. As for the verb “loathe,” it meant to be hateful, displeasing, or offensive when it first showed up in Old English in the late 800s, but the OED says that sense is now obsolete. “Loathe” went through several other senses now considered obsolete before the modern meaning of “to feel aversion or dislike” showed up in the 12th century, according to the OED. The dictionary’s first citation is from Poema Morale, an anonymous early Middle English work from sometime before 1200. “To breathe and loathe, to live and sigh, / Than once from dread of pain to die,” from Tennyson’s “The Two Voices” (1842). “Man who, as man conceiving, hopes and fears, / And craves and deprecates, and loves, and loathes,” from Robert Brownings’s “The Family” (1884). Although careful writers are now careful to spell the verb “loathe” with an “e” at the end, the OED has many literary examples from the past of the “e”-less verb. The OED even has a 14th-century citation for the adjective spelled with an “e” at the end, but you’ll have to trust us on this. We’re loath to give one more example. Does “daresay” have a past? Q: My dictionary doesn’t have a past tense for “daresay.” Is it “daresaid”? Or “daresayed”? Or perhaps even “daredsay”? I daresay you’ll have an answer. A: We haven’t found any standard dictionaries that list a past tense for “daresay,” a compound verb that means to think very likely or to suppose. In fact, many dictionaries specifically say that “daresay” is generally used in the first-person singular present tense (“I daresay”). “La Fleur … told me he had a letter in his pocket … which, he durst say, would suit the occasion” (from A Sentimental Journey Through France and Italy, a 1768 novel by Laurence Sterne). The OED says “dare say” (it uses two words) can mean to venture to assert or to assume as probable. The dictionary has examples of the first usage dating from the 1300s and of the second from the 1700s. “I dar seie & soþliche do proue, sche schal weld at wille more gold þan ȝe siluer” (“I dare say and truly do prove she shall wield at will more gold than silver”). Q: Any thoughts why the “.com” in a Web address is referred to as “dot com” and not “period com” or perhaps the more suitable “point com”? While journalists and editors often use “point” to mean “period,” we suspect that most people think of “point” in the punctuation or notation sense as short for “decimal point”—something used with numbers, not letters. Besides, “dot” was first on the scene in the world of computing. It’s been used for more than 30 years to refer to this punctuation mark in an Internet address. The American Heritage New Dictionary of Cultural Literacy (3rd ed.) uses “dot-com” when referring to Internet commerce and “.com” when referring to a Web address. We think that’s a good idea. The Oxford English Dictionary’s entry for the term spells it “dotcom,” but the dictionary notes the various other spellings mentioned above. No matter how it’s spelled, the term is always pronounced the same way (as a compound of “dot” and “com”). Learner driver or student driver? Q: I see driver education cars with stickers reading “Learner Driver” rather than “Student Driver.” The phrase “Learner Driver” just doesn’t seem right to me. Is it? A: Like you, we find the phrase “student driver” more idiomatic than “learner driver.” But we may be in the minority here. The word “student” in “student driver” is also being used attributively. Such a noun is sometimes called an “attributive noun” because the attributes we associate with the noun (“learner” or “student”) are used to modify another noun (“driver”). Q: “These ones” is never OK. Not here in the US, nor in my native UK. There is no “sometimes.” It’s simply wrong. The “ones” element is redundant. It’s “these” or “those” (for plurals), and “this” or “that” for singular items. A: We assume your remarks were inspired by our post in 2010 about whether the phrase “these ones” is ever legitimate. As we said then, we don’t like this usage. But we could find no authoritative evidence against it, and on the contrary there was reliable evidence in its favor. In the earlier post, we note that the linguist Arnold Zwicky says the use of “these ones” and “those ones” apparently isn’t considered odd or nonstandard in Britain. In the US, Zwicky writes on the Language Log, educated people seem to differ about the usage, and their opinions may depend on where they grew up. ”It’s possible that in North America ‘these/those ones’ is a variant in the gray area between standard and nonstandard—fully acceptable to educated middle-class speakers in some areas, but not fully acceptable, though not actually stigmatized, to such people in other areas,” he writes. The fact that we dislike a usage doesn’t make it incorrect. Nor does the fact that some online language junkies claim it’s wrong, without offering any evidence to support their opinions. You argue that “ones” is redundant in “these ones,” but do you really find “one” redundant in the phrases “this one” and “that one” for the same reason? And what about if we add a modifier to “these ones” or “those ones”? Would you object to “these heavy ones,” “those black ones,” and so on? Cambridge says “those ones” first showed up in the 19th century, and “these ones” in the 20th. However, we’ve found many formal and informal examples of “those ones” going back to the 1600s, and of “these ones” dating from the 1700s.